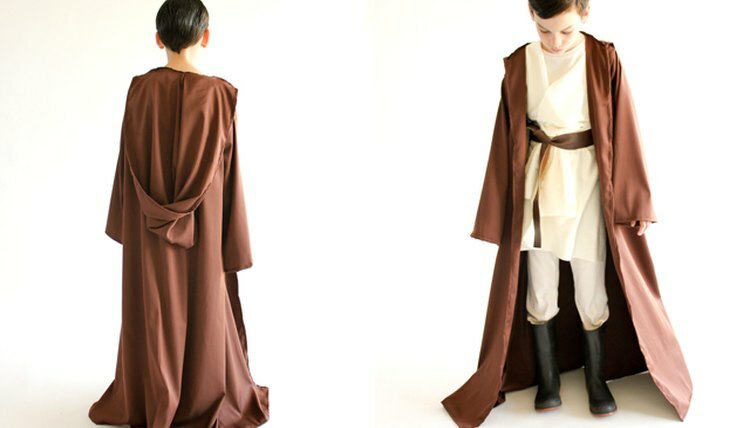 Whether you want to dress up as your favorite Jedi master or you favor the Dark Side, a good floor-length robe is what you'll need to create an authentic Star Wars costume. 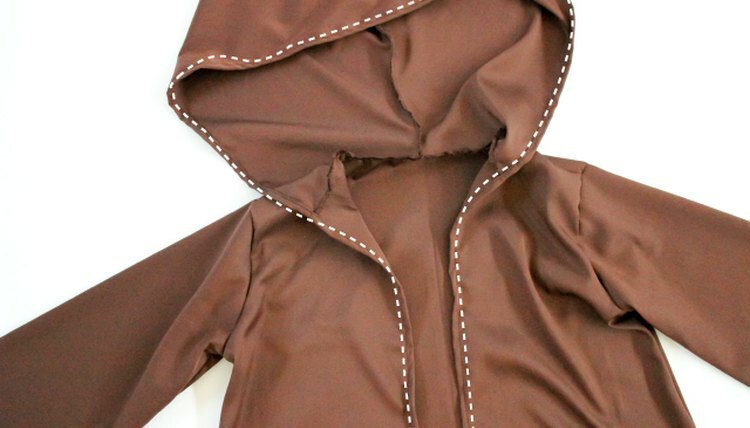 You can easily make a hooded robe in any size, using your winter coat as a pattern. Step out in this costume on Halloween, and the Force will most definitely be with you. Recommended fabrics: Heavy-weight knit fabric, polyester blends with good drape, and fleece all work great. Avoid anything sheer, too light, or too heavy, like canvas or jean fabric. If you choose to sew with a knit fabric, you want to avoid anything with too much stretch, as it may "grow" while you wear it. Fabric comes in a variety of widths from 44 inches to 70+ inches wide. Keep this in mind when deciding how much you'll need. The robe featured in this tutorial is a size 10 youth, and about 3 1/2 yards of 54-inch wide fabric was used. For a 6-foot tall man, you would likely need at least 6 yards. It is always best to err on the side of too much fabric, just in case. Pre-wash your fabric before you sew. This won't matter for most polyester blend fabrics or fleece, but knits often shrink significantly after the first wash. Pre-washing your fabric will ensure your finished robe won't shrink later. Consider sewing a muslin out of cheap fabric before you cut your final fabric. A muslin is like your rough draft. If you don't have time to sew a muslin, try to cut all your pieces a little larger and longer than necessary so you have room to make adjustments as you go. Using your cloth measuring tape, measure the person who will be wearing the robe. Start at the nape of the neck and extend your measuring tape down to the floor. Add 1 1/2 inches. Use this measurement to help you determine the fabric quantity needed and when you cut the robe's length. 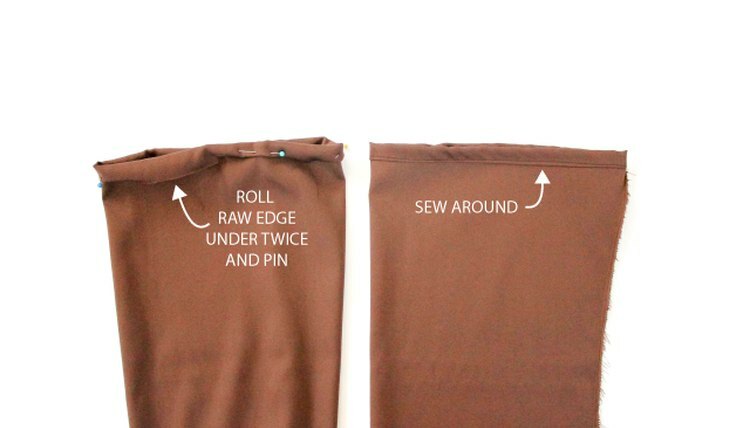 Fold your fabric width-wise. Pull the jacket sleeves into the inside of your jacket so that you can clearly see the shape of the jacket's bodice. Starting with the back of your jacket, fold the jacket in half or mark the center line and align it with the fold of your fabric. 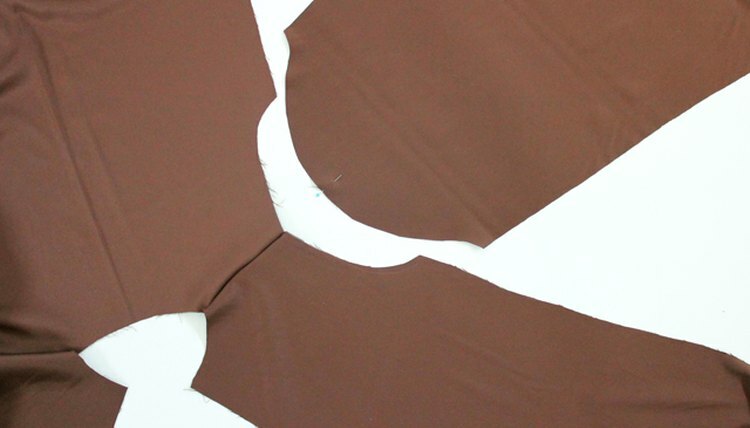 Trace around the bodice piece onto your fabric. Pull the hood of your jacket back as needed to get the bodice shape as accurate as possible. 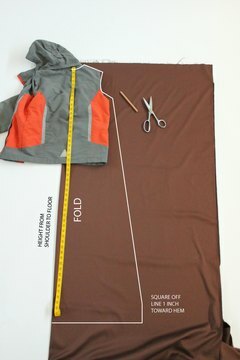 Be sure to draw your line 1/2 inch out from the actual shape of the jacket to account for the seam allowance. When you get to the end of the curve of the sleeve, instead of drawing straight down the side of the jacket, slant your line outward at a gradual angle and down to the hem or the shoulder-to-floor length measurement you determined in Step 1. An inch before you get to the hem or bottom of your robe, square out your line and extend it straight down. Cut out your fabric, but do not cut along the fold. The more you flare out the angle of the side of the robe, the more billowy and flowing it will be. If you want the bottom of your robe to have less volume, still ease the sides outward at a slight angle. Do not extend the line straight down, as it will look ill-fitting and it will restrict room needed for walking. Flip your jacket over to use the front as your pattern. Use the back bodice piece as a guide as well. 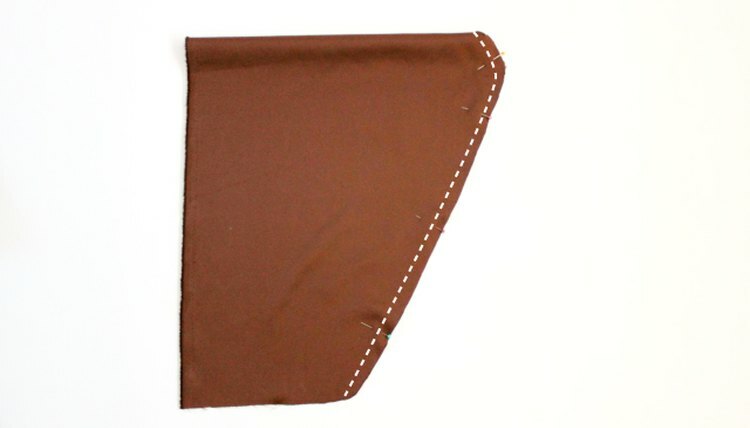 You may cut it on the fold and then cut down the fold line, as pictured, or cut the two pieces separately in a fashion which may conserve fabric. The front bodice should look almost identical to the back bodice, but with a slightly deeper dip at the neckline. There should also be two pieces cut as mirror images. 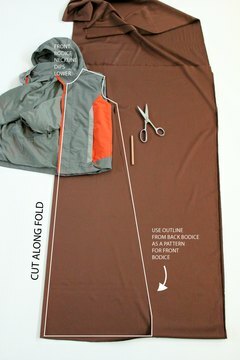 Lay one of your jacket's sleeves along the fold line of your fabric. Draw out your sleeve, pulling the bodice of the jacket back as needed to get an accurate shape. Notice how the sleeve curves in a bell curve-type shape where it attaches to the bodice. Remember to add 1/2 inch for a seam allowance. Instead of drawing a line straight under the underarm of the sleeve, slant it downward and away from the jacket sleeve. Extend the line to about 1 inch beyond the jacket sleeve hem, and square out the slanted line 1 inch before the hem, as you did the bodice pieces. Repeat for the other sleeve and then cut out both pieces. The more you the slant the underarm line of the sleeve downward, the more voluminous the sleeves become. If you want a slender sleeve, you may follow the jacket's underarm sleeve line, but be sure to slant the hem of the sleeve at least slightly downward to ensure good wrist fit and movement. 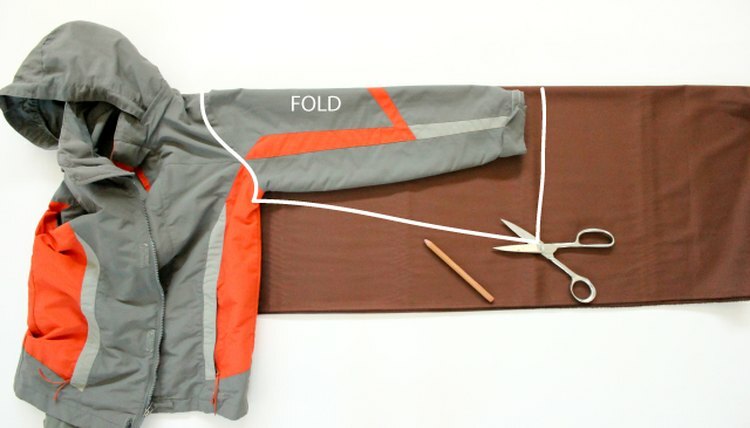 Fold a piece of fabric in half that looks about twice as big as your jacket's hood. Measure the length of the neckline of the the back bodice piece and both front bodice pieces. Add all measurements together, subtract 2, and divide by 2. Use this measurement for the bottom or neck of your hood. Draw this neck measurement as the bottom of your hood piece (a straight line is fine). Using the hood of your jacket as a guide, draw an exaggerated line around the rest of the hood, using the fold of your fabric as the top of the hood. 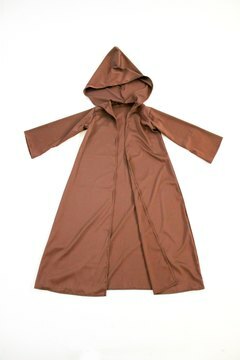 The taller the hood, the more it will slouch and drape when worn. You can make the back of the hood pointy by drawing a straight slant to the fabric fold, if desired. With the right sides (or the sides you want to show on the outside) facing each other, line your front and back bodice pieces up at the shoulder lines. Pin and sew the shoulders together with a 1/2-inch seam allowance, removing the pins as you sew. Trim the seam allowance down to 1/4 inch and finish the seam with an overlock stitch (serger) or with a zig zag stitch along the raw edge. If you are using knit or fleece, you don't have to worry about fraying and can skip this step if desired. 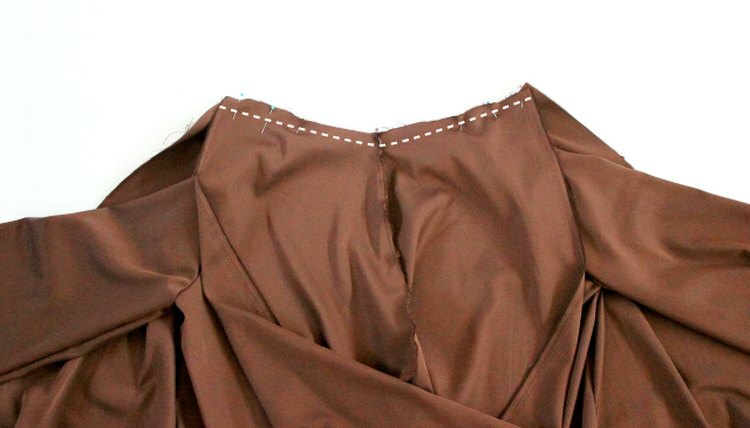 Finishing the seams is not necessary and will take more time, but it limits the fabric from fraying, strengthens the seam, and produces a better quality robe. Mark the center fold of each sleeve with a pin, open up the sleeves, and pin each to the arm curves or armscyes, with the right sides facing together. 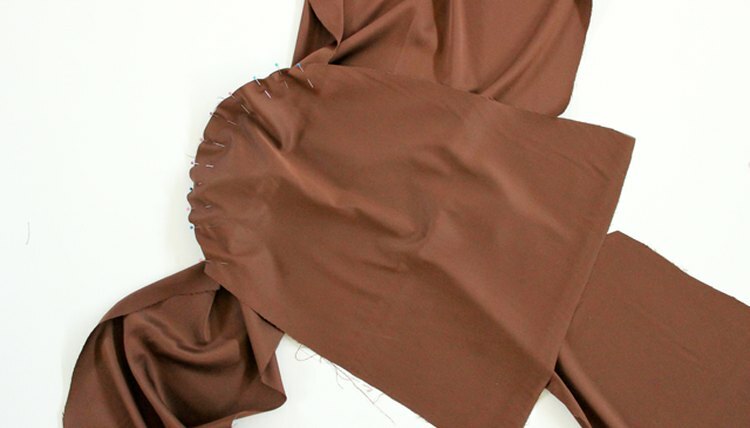 Be sure to start by aligning the sleeve's center pin with the shoulder seam and work your way outward. This will look like a hot mess when pinned, but once it's sewn in place, it will make sense. Just be sure the sleeve curve matches the length of the armscyes. This will likely be the part of your pattern that needs the most tweaking, if you are sewing a muslin. Make adjustments as needed. Sew the sleeve in place and finish the seam as desired. Repeat for the other sleeve. 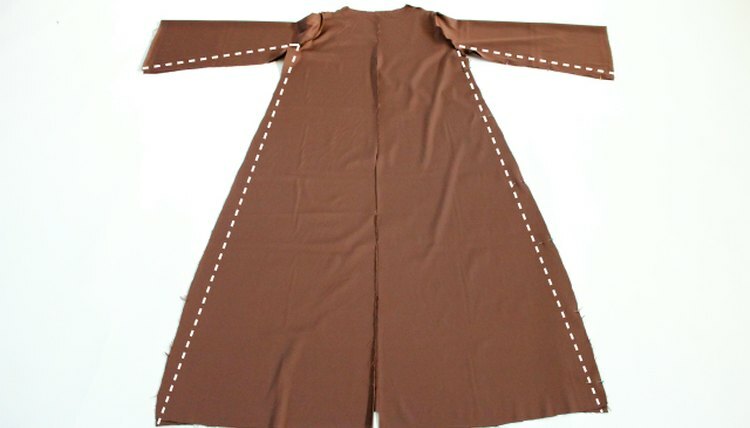 With the garment turned inside out, place the raw sleeve edges and sides of the robe together. Pin and sew from the sleeves to the hem. Finish the raw edges as desired. With the right sides facing together, pin along the back of the hood to the folded edge. Sew in place and finish the edges as desired. Align the bottom or neck edge of the hood to the neckline of the robe, with the right sides facing together. Pin and sew in place. Finish the raw edges as desired. Fold all raw edges under about 1/2 inch, twice, and pin in place. Sew or top stitch the folded hems in place along the first fold line. Hem the sleeves, bottom hem, hood, and front bodice pieces in this manner. The raw edges of the hood and front bodice pieces should match up and be hemmed as one edge. It is helpful to iron your double-folded hem in place prior to pinning and sewing, if your fabric can tolerate a warm iron without melting. Consult the fabric's washing and care instructions listed on the fabric bolt when you buy it. This is what your robe should look like with all the raw edges hemmed. You're all done! Slide on some boots and neutral-colored pajamas, tie a strip of scrap fabric around your waist, grab a blue pool noodle as your light saber, and you are Star Wars ready. Opt for a black fabric robe if your young Jedi leans more toward the Dark Side. 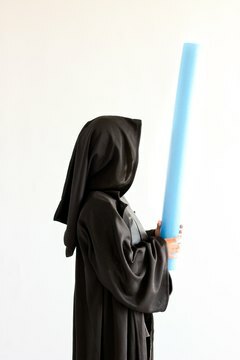 For more Star Wars costume inspiration and to see these costumes in action, visit Delia Creates. A mom of three and a maker by trade, Delia Randall, has been featured in Mollie Makes, All You, and Jo-Ann Arts and Craft stores. She dabbles in sewing, crafting, crocheting, and blogs about it all on her website www.deliacreates.com. Randall, Delia. 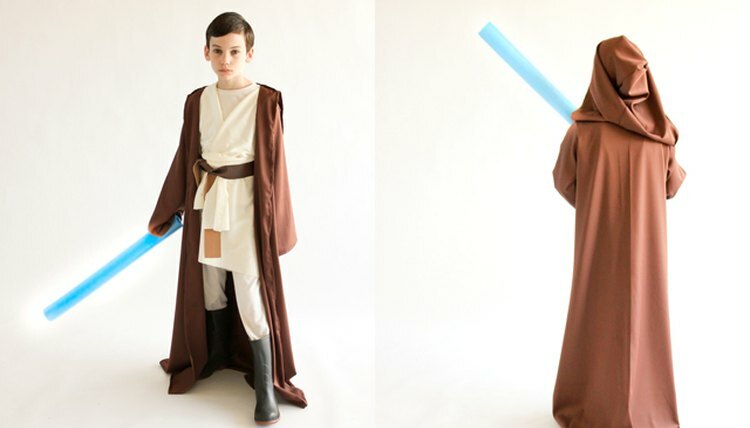 "How to Make an Obi-Wan Costume for Kids." 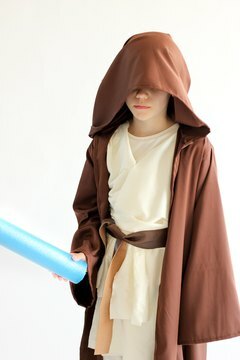 , https://careertrend.com/how-12342938-make-obiwan-costume-kids.html. 18 September 2015.